In this article you find a brief description of common machine-types used by manufacturers, a comparison between available solutions for shop-floor communication and a short ‘when to use what’ section. Conventional machines are not covered as the only way to communicate with them is to add a Programmable Logic Controller (PLC) and wire it with digital or analog in-/outputs. Computer Numerical Controlled (CNC) and PC controlled machines are usually built as universal machines that are sold to a large number of customers and enable them to produce customer specific parts in various batch sizes. By equipping the machine with different tools and NC programs (which instruct the machine to perform specific actions) a wide range of parts can be produced. Typically the electrical part of these machines consists of Drives, a NC-Kernel (NCK), one or more Programmable Logic Controllers (PLC) and a Human-Machine-Interface (HMI) usually a PC. These components are connected with each other by an internal, manufacturer specific Communication Bus (1) which provides real-time communication. Each of these components is responsible for specific tasks and, if required, exchanges information with other internal devices. For example the HMI may store NC Programs and displays information received from the PLC whereas the PLC performs real time actions, receives and maintains process and quality related data and controls the drives. If an NC Program is loaded the HMI informs the PLC about that and the PLC may report its own activities back to the HMI which can output the data. As programming of daily changing customer specific parts is common for this machine type NC Programs are independent from the machine’s PLC program and can be quickly loaded from or stored to external devices via one of the machine’s communication interfaces. PLC controlled machines are mainly used to perform similar, predefined tasks with a limited number of possible variants such as filling bottles or measuring distances.. The electrical part of these machines type typically consists of a Programmable Logic Controller (PLC), Drives and optionally a Human-Machine-Interface (HMI). In contrast to CNC/PC controlled machines here the PLC is the only ‘intelligent’ device which controls all other devices. The HMI is not a PC but just a simple I/O device (Terminal) that displays and allows direct modification of PLC data. To connect devices that require real time communication such as drives also an internal, manufacturer specific Communication Bus (1) is used. Each component of the machine directly communicates with the PLC, receives commands from and reports results of its activities or errors to it. Programs that allow execution of a specific task are usually part of the PLC’s main program and have to be loaded together with it. This procedure usually resets the machine, hence external programming of daily changing customer specific parts is not common for this machine type. Most of these machines are also sold to a large number of customers but are built to perform particular tasks in a reliable manner for a long time. Because these machines come with all possible program variants preloaded in the PLC, standard network interfaces (2) are not as common as on PC/CNC controlled machines. In case there’s only a serial RS232 communication interface additional hardware (3) is needed to be able to access the machine via a standard network. Some machine-manufacturers provide solutions that enable the customer to connect their machine with his existing IT infrastructure. In most cases these turnkey systems include application software that outputs a really high level of details about the connected devices from performance related data to process- and quality output. Usually these programs exchange data with the machines by using a complex communication protocol. As the machine-manufacturer knows his machine and the requirements of the user he is able to deliver a proven, reliable solution. Because of the fact that a PLC is a standard part with disclosed, commercially available communication protocols it can easily be accessed, this is one of the core components of the OPC (Open Process Control) technique. 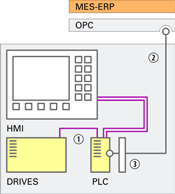 Products that are based on OPC are able to read from and write to memory areas of a PLC. On the host computer side OPC solutions use a standardized language that defines objects, functions and methods. Incoming data from different PLC types appears in one homogenous format. Information that should be written to different PLC types can be input in one standardized language. This standard follows the concept of using ‘Adapters’ and ‘Agents’ to enable the user to acquire data from machines from different manufacturers and use it with his existing IT solutions. The adapter is usually placed directly at the machine’s HMI (PC) and is responsible for translation of machine specific output into a standardized data format. The agent is installed on a networked PC and queries data from the adapter by using the standard HTTP protocol. The agent itself can also be accessed by other applications via the same protocol. For communication with PC/CNC and PLC controlled machines CNCnetPDM utilizes communication libraries that are able to access the machine by means of device specific communication methods and protocols approved by the machine-manufacturer. 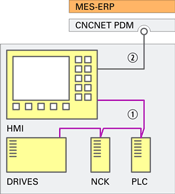 For each machine type CNCnetPDM can be equipped with and use a specific library. The libraries offer function calls that, when executed, access, read and write data from and to the machine’s internal devices. CNCnetPDM induces the library to execute function calls to the machine in its specific ‘language’. It receives the returned values, logically combines them and translates the result into a homogenous, standardized data format regardless of the controller type. Enables to write data to different machine types. Machines where data has to be queried from sources that are connected to the machine’s internal communication network.